I changed the name of my blog because I saw it somewhere & it made total sense to me because my life,not to mention my wardrobe(though I don't wear a lot of it)is very full of bursting colors!But I've yet to find a blog layout that I love..tried the polkadots & stripes one for awhile but I'm like...nah!Hopefully I'll find a better one soon..Cos' I'm getting sick of this old layout..I need a change people!hahaha. Last Saturday,had a big family lunch at my grandma's hse.Some of my cousins from Alor Setar came too..I've been catching up on my reading.Just finished 'Does my head look big in this'and it was hilarious! Now I'm trying to finish reading the newest Cecelia Ahern's book,'The book of tomorrow'.Also I've been hooked on this Korean series,Witch Yoo Hee,thanks to my cousin Fir who stayed over last Saturday.After that,I'm going to watch Cirque Du Freak..woohoo! I baked some pineapple tarts upon the request by my mum..who can eat a lot of it in one seating..huhu.I hope to try recipes from Cakespy this week..I just love that site!The picture way above,is of the rainbow cake from Dozen Bake Shop that was taken from that site..isn't it so pretty?? 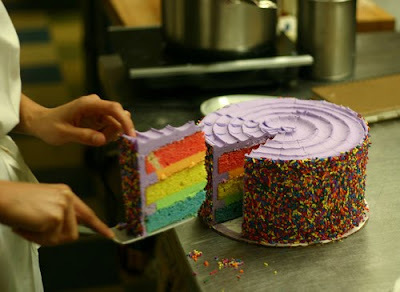 ?I would love to bake that cake! Love falling Slowly, Love Once, Love Glen Hansard! That cake looks delicious! LOL! it's been a while since aq ade mase nk comment2.huhu. congratz for ur blog's new name..lagi besh aq rase name nie.